I am a very lucky allergenista, as you all know, I have a new full time job; well it’s in sales so it’s full time plus, and sometimes I get home after 8 or 8:30, but my wonderful husband, Mark, always has a hot meal ready for me when I get home. 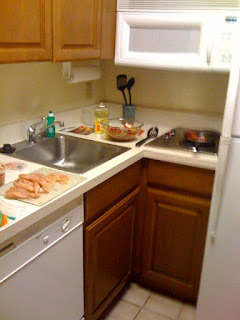 As I went through culinary school, Mark's skills as a cook have improved right along with mine… but this last week Mark has been really busy with his own computer consulting business (he did my website) and hasn’t had time to prepare homemade meals. Well, were we in luck- Teri Whisenhunt, of Mixes from the Heartland sent me some samples of her product to try and dinner can be made in as little as a half hour, so we haven’t missed a beat! Mixes from the Heartland is based in Amarillo, Texas which is part of the panhandle, this facility is free of wheat, soy, barley, oats, rye, eggs, nuts and by products. Some of their mixes do contain dairy or shellfish, so be sure to read the labels. 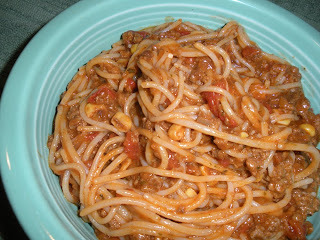 We tried the Tex Mex Spaghetti Meal and Texas Bean Bake Meal. 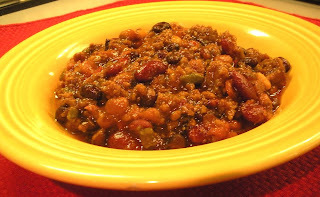 The Texas Bean Bake is very similar to chili but has an interesting sweet and spicy taste, and the Tex Mex Spaghetti is tasty with a little kick, I love heat, so this will definitely be a staple in our home. I have dairy allergies so some of the products are off limits to me, but never fear, I am making some for my sans allergy friends to test and will keep you posted for those of you that can enjoy dairy products. Having tried these convenient, tasty and reasonably priced meals require only a few readily available ingredients to make a full meal. Teri shared with me, “it kills me to know how high the prices are for Gluten Free products.” We used a pound of ground beef with our mixes and the cost came in under $10 with leftovers for the next day. Teri is also starting a new Organization, called Gluten Free Families in Need, to help feed families that suffer with allergies eat safely and well, how cool is that? I was so impressed with the company and quality of the products, I asked Teri to provide me with some samples for our Safe & Sound dinner on February 9th, I received a huge box of samples for our gift bags and can’t wait to share them with you. Did you ever wonder what spices go with quinoa or what would be the best sides to compliment pork? Well, you are in luck, there is a great book that shows you every ingredient, when it’s in season, and what other ingredients go well with it. 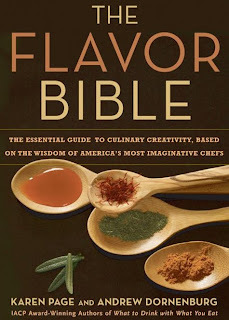 It’s called, “The Flavor Bible”, by Karen Page and Andrew Dornenburg. 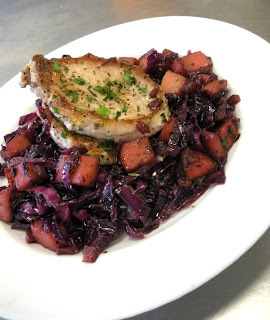 I used it to create the pork, apple and red cabbage dish below, I was pleasantly surprised by the results. Please share any new recipes you concoct with this must-have book. Heat saute pan over medium heat for one minute. Add olive oil and heat another minute. Sprinkle salt and pepper over both sides of pork chops. Mix together thyme, parsley, Kosher salt and black pepper, reserve. Place pork chops in pan and cook until brown on both sides, reserve. Add onion and sprinkle with half of spice mix and cook until onions are soft and translucent. Add apple, cabbage and remaining seasoning, cook until soft. Add champagne vinegar and red wine to deglaze pan, cook until liquid reduces by 1/2. Half way thru reduction of vinegar and wine, sprinkle sugar over cabbage, apple and onion mixture to taste. Place pork chops in pan to reheat. When I threw down the Safe & Sound challenge to Chef Kurt Guzowski of Landmark Grill & Lounge , I knew it was going to be good, and boy did he deliver! The menu for our February 9th dinner is creative, interesting and most important, free of the Big Bad 8 allergens and Gluten. There is limited seating available for this special dinner and we are almost ½ way full, so don’t wait to reserve your place. 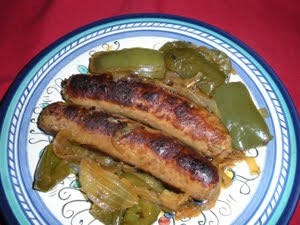 **These are not the brussel spouts you refused to eat as a child… all I can say is YUM! SWIRLZ CUPCAKES is bringing the dessert! Not just any dessert, Pam Rose, is working with her baking team to create a special flavor that will compliment this decadent menu. I will update my website with gift bag contributors as they come in, stay tuned! My apologies to my favorite allergenistas, two weeks of training for my new job has kept me out of the kitchen from making new recipes. Notice the little burners in the kitchen in my room; I made fajitas last week and the room still smells of onion and garlic! I did want to share with you the wonderful experience I have had at Staybridge Suites in Columbia, Maryland. I filled out a comment card stating that they needed to have more options for people with food allergies and celiac disease. I got a call today, from their Director of Sales, Alicia Smith, she offered to drive me to the grocery store, so that I could pick out foods that were safe for me to eat and even paid the bill! It was really above and beyond. I showed Alicia some options to buy to have on hand in the future for other guests that have allergies, she was very happy to learn how to accommodate us allergenistas! I would encourage you to stay at these hotels, make sure you call in advance so they can prepare for your visit. Chef Kurt is finalizing the menu for the Safe & Sound and should have the menu to me on Thursday (you can’t rush a masterpiece! 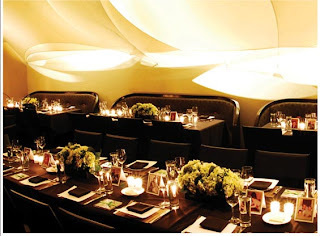 ), there are only 45 seats available at this restaurant, so don’t delay registering for this special event. Here is what other allergenistas are saying about Safe & Sound Dinners…. I just started a new job and am training in Maryland this week. The interview process took place in the matter of days and in a blink I was off to O’Hare. I didn’t give much thought to what I would eat while I was gone, and WOW, it’s not easy to travel with food allergies without a plan ….office lunches brought in, breakfast at the hotel, you know the kind, waffles, toast, bagels, although they had cereal I could eat, no rice milk, top it off with dinners at the guy’s favorite sports bar. Eating with allergies has been difficult to say the least. With that in mind, I had to think of a way to work around this… So below are some ideas I put together to ease your travels. Bring food from home – you have already done the homework on what is safe, just bring it with you. When you get settled, find out where the closest grocery store is and stock up on snacks and dinners safe for you to eat. You might want to bring a can opener and silverware from home in case you can find some of Amy’s soups or allergen free frozen dinners. Download our restaurant safety sheet to bring into restaurants. Ask the server to have it follow your order thru the kitchen. It explains your allergies and gives protocol to avoid any cross-contamination issues. If you have time to prepare, a little internet research goes a long way, find out where the best allergen free stores and restaurants can be found. See if your company can put you in a hotel that has a mini kitchen and cook your own meals, it saves money and you will know exactly what you are eating. I am staying at the Staybridge Suites and they have a cute little kitchen complete with dishes, pots and pans and even a dishwasher to save you time on the clean-up. It takes a little effort, but you can eat just as well on the road. Pre-allergens I used to love the Italian sausage at Portillos. Topped with sweet peppers and onions – oh so good. 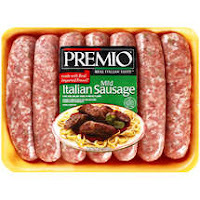 When I went shopping at Costco I came across Premio Italian Sausage which are naturally gluten free. Actually, most of their products are gluten free. So I took them home and started cooking, this is a very simple recipe. If you wanted a great roll to put it in, try Deerfield Bakeries . You can buy Deerfield Bakery products at select Whole Food Market stores (call in advance to make sure they carry) or on Deerfield’s website. Enjoy! Brown sausage thoroughly on all sides. Add onions and peppers and sauté 5-10 minutes. Add remaining ingredients, cover and simmer about an hour. Serve on your favorite Allergen free rolls. As the new year begins we are all looking for recipes that are both delicious and safe for our family. The following bloggers/websites are offering free recipes and e-books for their recipe collections. Please share you favorite sources for recipes. First up is one of my favorite bloggers, Jenn Sutherland of The Whole Kitchen just wrote, “Excerpts from the Whole Kitchen” and all I can say is what a flavorful, inspiring collection of recipes, I particularly like the corn chowder, which I have modified to be one of our favorites… You can buy the book for $28 or download the ebook for FREE! The Ener-G website has a feature where you can input your allergens and Ener-G will supply you with recipes that are safe, all FREE. The Food Allergy and Anaphlaxis Network also has a collection of free recipes where you can input your specific allergens. This site allows you to rate the recipe, which is really nice for those of us allergenistas as we all have had a recipe gone wrong substituting ingredients. Before I get started, I wanted to share with you an allergy free recipe contest at Allergies and Me, you can win up to $150 in product from their on-line store, they will be showcasing some of my recipes on this site later this month. Please let me know if you submit a recipe, I will keep my fingers crossed for you! The best part about blogging and being part of the internet world is that I get to hear back from you, please share with us your favorites. Food manufacturers have come such a long way in the quality of foods that are safe for us, it’s only going to get better. Ok, fellow allergenistas, as we all know, every allergen free flour has its own consistency, taste and practical application. With that in mind, I will share with you how I use each flour, along with links to recipes using that flour. Bob Red Mill’ All Purpose Flour – I use this flour for cooking (to make roux and for the first step of the breading process) and my cinnamon sugar cookies and shortbreads. It is perfect for pie crusts that will hold savory filling, like my chicken pot pie . 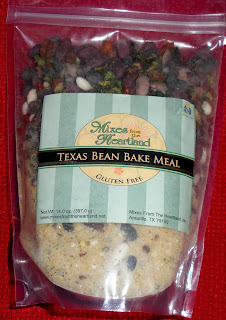 Bob uses Fava Bean flour in this mix, so the taste is a little stronger than other brands and is a little more coarse. Jule’s All Purpose Flour – I use this flour for my sugar cookies and any other basic baking recipe. Jule’s is always adding new recipes to her website using her flour and offering discounts on her products, I encourage you to try this flour mix if you are baking sweets. I haven’t tried Jule’s in my cooking applications, but can’t wait to! 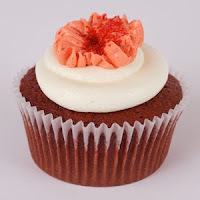 SWIRLZ Cupcakes – What can I say about these decadent treats? Not only does SWIRLZ have a gluten free cupcake they also carry vegan (no egg or dairy) variety that is so good, you might need to invest in larger pants! Swirlz has been present at our Safe & Sound dinners, and is making a guest appearance at our dinner at LANDMARK Grill and Lounge on February 9th. Sorry allergenistas with soy allergies, SWIRLZ uses soy milk in their formula. Dr. Lucy’s Cookies – I found out about these cookies thru Peanutfreeplanet.com, they are so addictive and come in different flavors like cinnamon sugar, chocolate chip and oatmeal. Check your favorite flavor to see if it is safe for you. Ener-G Cinnamon Crackers – These crackers are crispy and sweet, you’d never know they are allergen free! The best part is they are multi-purpose, you can crumble them for pie crusts or just add milk for a sweet breakfast cereal. The ingredients include Filtered Water, Hi Maize Corn Starch, High Oleic Safflower Oil, Organic Tapioca Syrup, Yellow Corn Flour, Xanthan Gum, Methylcellulose, Evaporate Cane Juice Sugar, Cinnamon Powder, Salt. 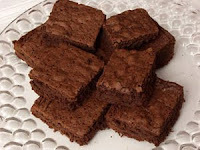 Really Great Foods Aunt Tootsie’s Brownie Mix – I shared these brownies with the allergenistas at the THRIVE food allergy show, I was amazed at how close to the real thing these brownies were (sorry, for best results they require egg). The ingredients include: white rice flour, potato starch, Dutch cocoa, sugar, aluminum-free baking powder, vanilla powder, salt. Brother’s Natural Food Snacks – for those of you watching your waist after the holiday feeding frenzy, these healthy low-calorie treats hit the spot. Brothers-All-Natural Fruit Crisps are peanut/tree nut free, gluten free, soy free, dairy free, vegan, and OU kosher certified. They are dehydrated fruits in flavors including: Fuji Apple, Pineapple and Strawberry. You can sometimes find them at Costco, but they are always at Lil’s Dietary Specialty Shop . With the new decade beginning we can be excited as food allergies were listed as a “trend” in The Washington Post and Food Channel.com. Although I am grateful for the additional exposure for food allergies and Celiac disease, I would prefer it wasn’t a trend, because as the trend ends, we still have our allergies/Celiac. 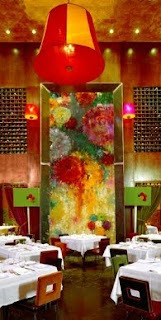 I wanted to share with you my favorite restaurants and shopping locales. I am only one person and although I am constantly looking for new things for my favorite allergenistas to try, I want to hear back from you, let me know if there is something I missed or a new product/restaurant that we should try. The lists are in no particular ranking order. There are many restaurants out there that have gluten-free menus, I think it is great that they accommodate this group, but this list is based on a restaurants willingness and creativity to adapt to multiple food allergies. Please share any restaurants where you have had a good experience. CARNIVALE – Carnivale also avoided 30 allergens the night of our June Safe & Sound dinner, the thing I really liked about CARNIVALE is when some of the guests had requests for vegetarian, they didn’t even come to me, they just took care of it, and it was a beautiful vegetable tureen, something well thought out and inventive. Da Luciano’s – Da Luciano’s is run by a family that has 4 members that suffer from Celiac disease. They have a dedicated gluten free kitchen, but also accommodate other allergens including dairy and corn. I recommend their pizza and bruschetta. Ina’s – Ina’s has a monthly GF fried chicken night. In 2009, they expanded the chicken to be dairy free and egg free (you need to call in advance). In addition to their fried chicken special night, Ina serves breakfasts to die for…. Bistro 110 - Bistro 110’s Chef Dominique Tougne has children with food allergies, so he understands the needs of us allergenistas and provides wonderful allergen free alternatives to allergen-laden French cuisine. This category is for retail locations only in the Chicagoland area. I have placed an * next to the stores that will ship for you. Lil’s Dietary Specialty Shop* – One of my favorites, Lil’s shares samples and the owner goes out of her way to find you products that are not only safe but delicious. Whole Foods Market – Whole Foods has been a wonderful resource for people with food allergies and celiac disease, classes, samples and a large offering of allergen friendly/free foods. If you want Whole Foods Market to carry a certain brand, talk to the grocery team leader to see if they can carry it. 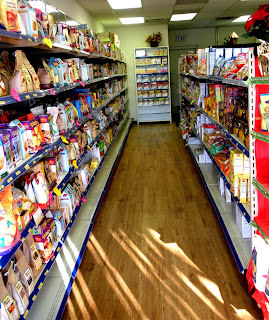 Gluten Free Store* – This store in Northbrook, IL has a large selection of allergen free products with a corn free section. Soup to Nuts – This Geneva, IL store was one of the first stores to start carrying allergen friendly products, owner JR, prides herself on having a café to have lunch while you shop with lots of allergen free options. Free From Market* - I have not been to the Free From Market yet, but hear great things and wanted to include it on the list. Free From Market has special product tastings so you can compare brands before you buy! I encourage you to share any locations you frequent, even outside the Chicagoland area. I hope my experiences have been helpful to you this year and look forward to trying the restaurants and shopping locations you recommend.